Searching for a Security-Protection Company that takes your event as personally as you do? With JMN Investigations & Protective Services , we know how important this is to you, and that’s why we are proud to provide you with the type of Security Service you expect and deserve. JMN Investigations & Protective Services has extensive experience in providing Event Security Service in all types of Events, including; Corporate Events, Shareholder Meetings, Promotional Events, Exhibitions, Trade Fairs, Media Lunches, Concert Events, Dance Events, Festivals, Public Mass Gatherings and Private functions. JMN Investigations & Protective Services success is based on the quality of our personnel. We deploy entertainment aligned, relatively youthful, enthusiastic, professional and friendly personnel, who are trained to be flexible, innovative, adaptable and self-sufficient. They are always aligned with and representative of Client operations and are deployed on the basis of Client specifications for presentation, strength and experience. 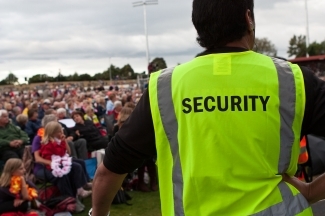 When hiring a Company for Event Security, your reputation and business are at stake. We appreciate your trust in our Organization. Like you, our Reputation relies on ensuring that the wider public and our Clientele, are accommodated within well planned and managed programs. Planning and preparation that relies on our knowledge and experience are as much a part of our operations; as providing top quality personnel from; Law Enforcement, Military and Corporate Security Backgrounds. It is our continued aim to provide an efficient and effective service by maintaining an awareness of changes and improvements in safety, security and customer service. We forge long lasting business relationships with our Event Security Clients, and look forward to proving our value to your Business!